It’s been a long time coming to theaters, but It turns out to have been worth the wait. The cinematic adaptation of what is arguably Stephen King’s most famous novel is absolutely an excellent horror film, but its real success is how it exceeds just horror—it’s dramatic, funny, and, most impressively, has way more heart than any movie about a terrifying clown should manage to have. Directed by Andy Muschietti (Mama), It begins in October 1988 with two brothers: Bill (Jaeden Lieberher) and Georgie (Jackson Robert Scott). Georgie goes to play in the rain and encounters Pennywise (Bill Skarsgård), a demonic clown that has been terrorizing the boys’ hometown of Derry, Maine, for a long time. Between his upsetting squeaky voice, his unnatural yellow eyes, and, you know, the fact that he’s a demonic clown, he radiates a sense of unease that threatens to turn into horror at any time. 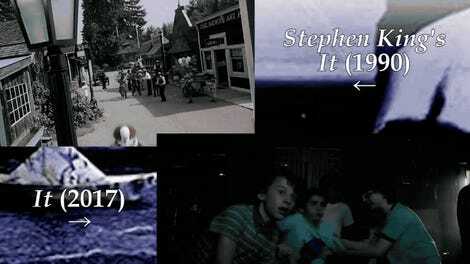 It then jumps to June 1989 and we meet the rest of our heroes, the Losers Club, as they’ve been unkindly nicknamed. They’re 12-year-olds who get bullied, swear, make fun of each others’ mothers, ride bikes around town, and feel authentic in the same way the kids of Stranger Things did (which, for the record, is influenced by this, not the other way around). Muschietti spends a good amount of time with these characters, making sure we understand their individual fears and, more importantly, the bonds they share and build with the new members of the group. Primary among those new members is Beverly (Sophia Lillis), the lone girl in the bunch. Thanks to a star-making performance from Lillis, she becomes the focal point for much of the action to come. Each of the others Losers has their own thing: Bill is the leader with a stutter, Ben (Jeremy Ray Taylor) is the chubby new kid, Richie (Finn Wolfhard) is the loudmouth, Eddie (Jack Dylan Grazer) is a hypochondriac, Mike (Chosen Jacobs) is the home-schooled outsider, and Stanley (Wyatt Oleff) is the timid one. That’s a lot of characters to juggle, and It makes them all unique and necessary to the story, but also gives us just enough time with each of them so we care about them, too. 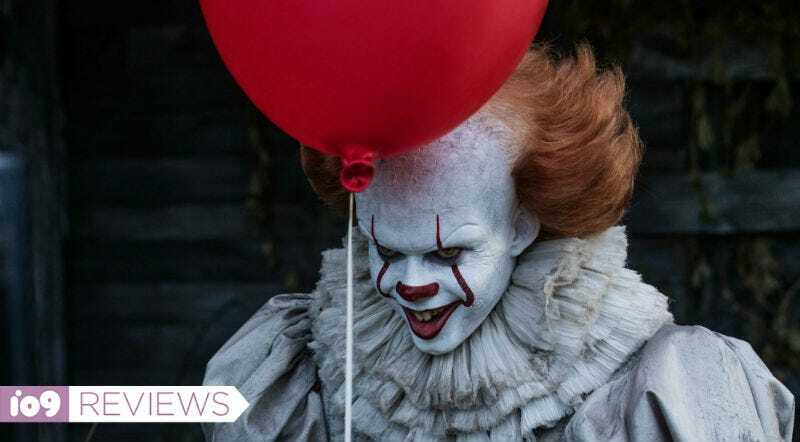 Each character is primarily viewed through Pennywise preying on their individual fears, and the encounters are bone-chilling for different reasons. One might be a jump scare, another might have an extreme amount of suspense, yet another may be profoundly disturbing. It helps propel the movie forward, but it also contributes to the film’s biggest problem, namely its lack of focus. For most of the film, the camera and story are never quite sure what to focus on, so everything just kind of moves from character to character, story to story, without a strong aim. While the kids are remarkably charismatic, you almost feel like you’re flipping through TV channels with shows based on each character—Bill, click, Richie, click, Beverly, click—because it’s shifting around so much without a cohesive structure. But if the overall story feels a bit disjointed, that doesn’t make the film any less entertaining. In what should be a surprise to absolutely no one, Skarsgård’s performance as Pennywise is horrific in the best possible ways. His stare is as piercing to the audience as it is to the kids, and when he gets more animated, his movements (with a little help from digital effects) are completely unsettling. Plus, his scares are never the same. That itself is one of It’s most successful components. You may have guesses, but Muschietti always tries to buck expectations, which will keep you on your toes. The director also includes some human villains who are arguably as scary as Pennywise—that’s how far he goes to keep the audience guessing. Keeping the audience in the dark extends to the plot as well, which leads to its own problems. While we spend plenty of time with our main characters, everything that happens in the world around them is very murky. The script provides a tiny trail of breadcrumbs to piece together that outside world—what’s happening with this town, what the deal with Pennywise is, and why the adults don’t seem to be concerned—but the path ends at vague speculations, not revelations. Of course, keeping some things unanswered makes for a scarier movie, and obviously the film shouldn’t spoon-feed us information, but the film’s lack of answers can sometimes feel more aggravating than mysterious. Still, the film’s many strengths more than outweigh its few problems. With help from the characters, performances, humor, and aforementioned heart, It is a horror movie that should delight fans of the genre and general audiences equally. It leaves us excited that while we have this one really strong standalone movie, a sequel will be coming—based on the second half of King’s novel, about the kids as adults. We’re definitely looking forward to It.